Let’s talk, friends. 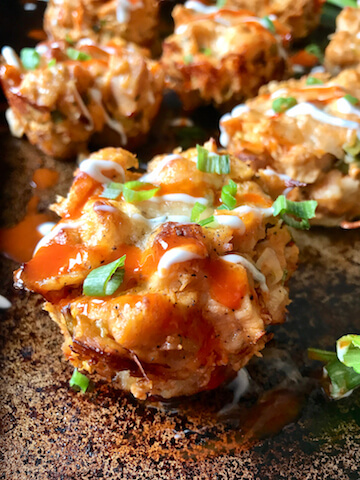 Buffalo Chicken Tater Tot Cups. That’s right… Buffalo. Chicken. Tater. Tot. Cups. This just might the best recipe I’ve ever created. I mean, yeah, I’ve said that before. But this time, I think I mean it. Probably. Anywho… Fall is in the air, I’m using my oven again, and I feel like I want to eat everything that is “stick to your bones” yummy… without it actually sticking to my bones. And we have so many different get-togethers coming up over the next few months! There’s Holiday meals, family functions, parties, and the classic American Sunday Football hangout. Is that the right thing to say, hangout? I mean, it’s not really a party… we’re just hanging out and eating good food. And while I’m not paying any attention to the football game, that’s the reason we’re getting together. These are the perfect thing to make for ALL of these occasions. Tons of people love all things Buffalo Chicken, right? Well, I’ve got the perfect thing. 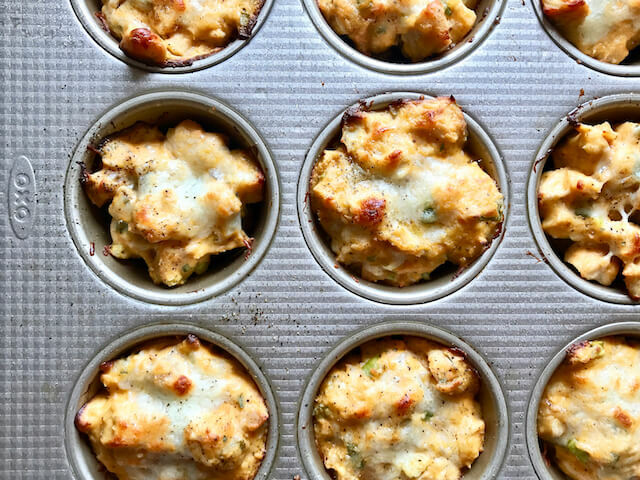 These little cups are full of all the good stuff- like chicken, ranch seasoning, cream cheese, buffalo wing sauce, green onions, mozzarella, and a little greek yogurt to bind it all together. But the most important part? Tater tots… Tater tots in the form of a crust, folks. The last time I went grocery shopping, I bought like a 5 lb bag of tater tots because, who doesn’t need a 5 lb bag of tater tots? Ha! Eric and I were discussing how they’re such a perfect food, and it’s pretty much impossible to replicate a tater tot at home. The only way to get a good tater tot is to buy’m in the frozen aisle of your grocery store! And that’s fine by me because they are delicious, and perfect, and I want them in my life forever. 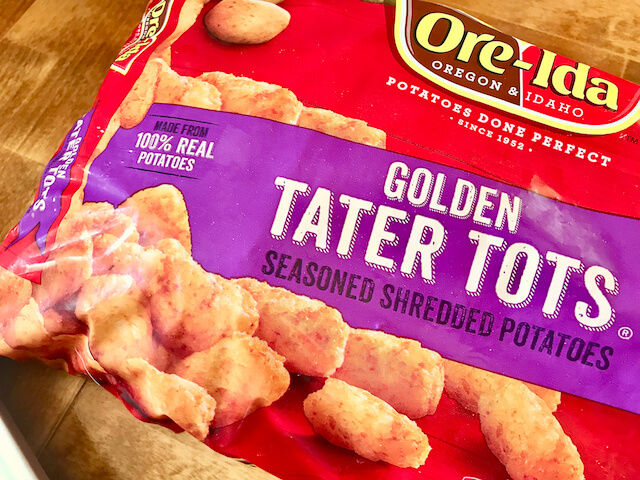 As you can imagine, having a 5 lb bag of tater tots in your freezer can be a little daunting… all I want is tater tots. 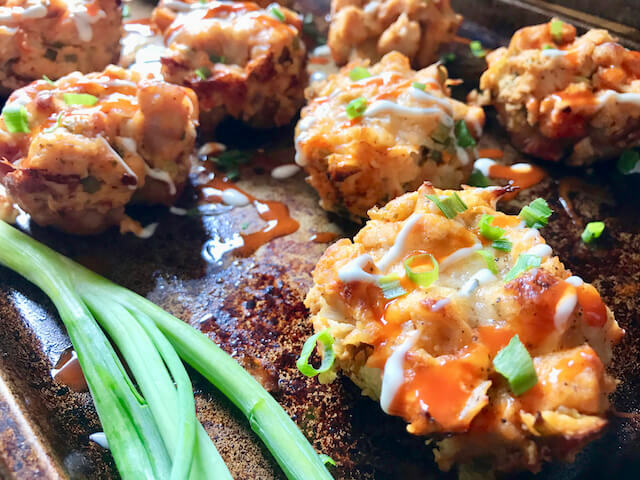 So in an effort to balance a little indulgence with a whole lot of healthy, I’ve been coming up with a bunch of recipes that include tater tots. This means I’m a happy camper because I get to enjoy my tots, and also continue to fit into my jeans! Have y’all heard of Tater Tot Hot Dish? It’s a Midwestern thing, and it’s one of my favorite things about the Midwest. I think it originated in Minnesota, but… there’s like a 98% chance that I’m wrong. I grew up on “Tater Tot Hot Dish” because my mama is actually from a little town in Minnesota called Cokato. 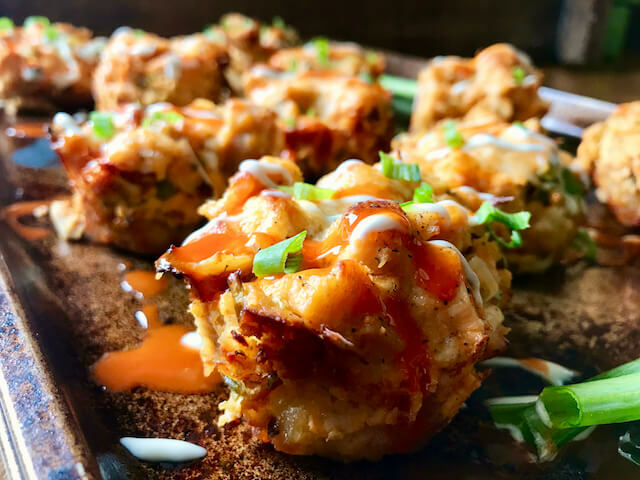 So way back when she moved here to be with my dad, she brought her recipes for different Tater Tot Hot dishes to our dinner table, and then and there began my love affair with tater tots. This recipe is basically a story of my love for these amazing little potato nuggets. These are fairly effortless to make, but to get everything cooked up nicely, they do require just a bit of hands-off time in the oven. 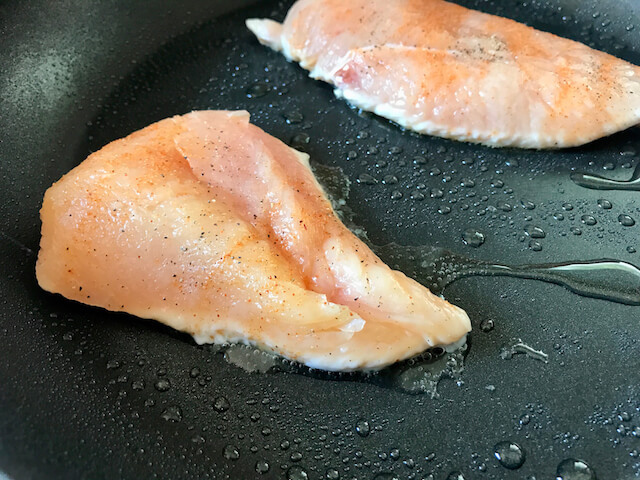 Also, I’ve provided in the instructions how to make some easy and quick chicken breast in the pan, but you can totally use precooked shredded/pulled chicken, chopped chicken breasts leftover from another meal, or some rotisserie chicken from the grocery store. Now let’s get into the kitchen! Start off with a five pound bag of tater tots, okay? I’m just kiddin’ it doesn’t have to be five pounds, but you might as well buy the tots in bulk. Because you’re going to want to make approximately 50 batches of these guys. Side note: While editing this photo, I realized Ore-Ida stood for Oregon and Idaho… Am I the only one who never knew this!? Please tell me no. Preheat the oven to 425 degrees. Grab a 12-cup muffin pan, and spray each cup very well with some cooking spray. I personally use either coconut oil cooking spray or avocado oil cooking spray, because these oils work much better with higher heat. Place them in the oven for 15 minutes. P.S. – you’re going to add four tots to each cup, not three like in this picture. 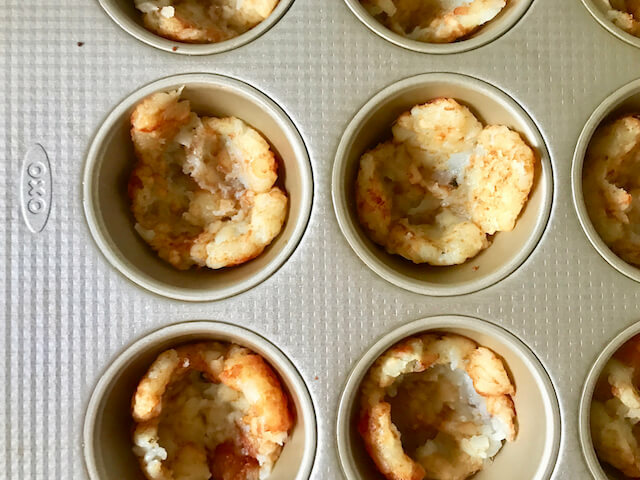 When I made the recipe to photograph them, it was before I figured out all of the nutritional information and after I did I realized… you can have one more tot in each cup… and why in the world would we not stick one more tot in each cup, right? Anyway, I made’m a few more times using four tots, and it worked perfectly. If you don’t happen have any chicken already cooked on hand you’ll need about 1.75 lbs of fresh chicken breast. If they’re thick cut them in half, and just simply season’m up with salt & pepper, or I use Lawry’s Seasoned Salt. Throw’m in a non stick pan sprayed well with cooking spray. Cook for about 4 minutes on each side, and until your meat thermometer reads 165 degrees. Remove from the pan, set aside, and let them rest for 5-10 minutes. 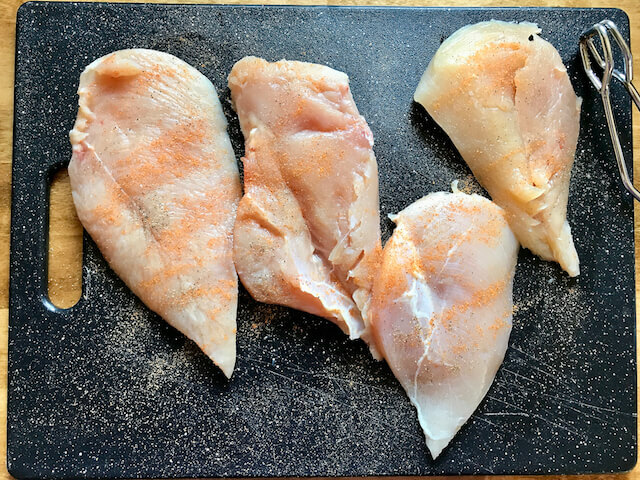 Letting the chicken rest will “seal” in those juices, and keep your chicken from drying out. 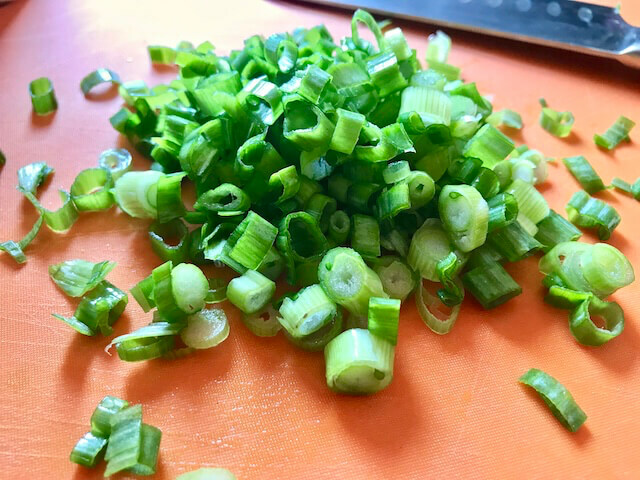 Now chop up 4-5 green onions, About 3/4 cup worth. 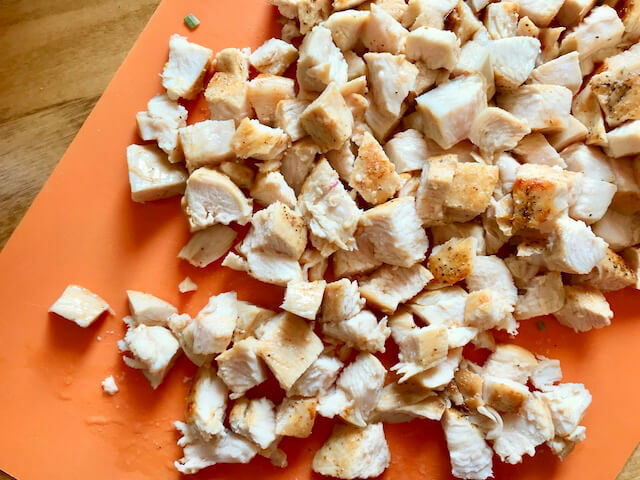 Then chop up your chicken breasts into small pieces. 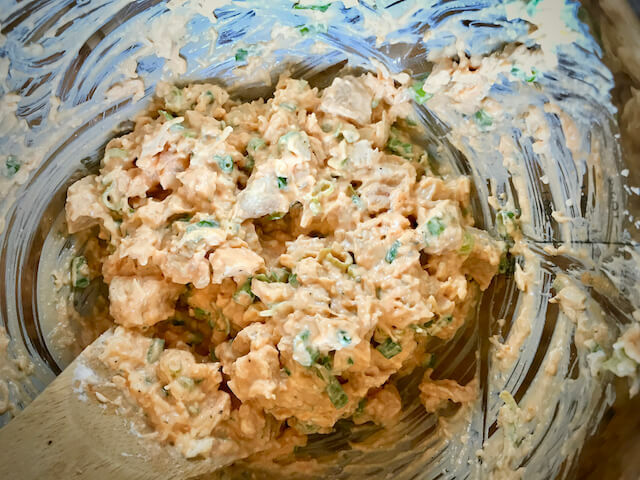 Grab a large bowl and add the chopped chicken, green onions, 2 ounces of light cream cheese, half of the mozzarella cheese, 1/2 cup non fat Greek yogurt, aaaaand 1.5 tablespoons of ranch seasoning mix. Don’t forget the Buffalo Sauce! 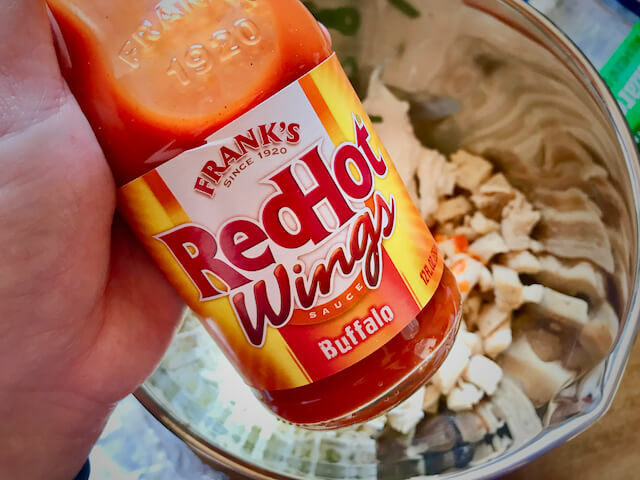 Be sure it’s Buffalo wing sauce, not just hot sauce. It makes a world of difference. I add 1/4 cup and I think that’s the perfect amount of spice, but you can add a little more or less, depending on the spice level you prefer. Stir it up real good until all the ingredients are combined well. Okay, now those tots should be outta the oven and ready to be filled. Have you guys heard of a Tart Tamper? Okay, I’ll admit. I have one of these for one reason only- during Christmastime I make Thumbprint cookies, and my mom told me to get one. I never thought I would use it for any other reason than for the thumbprints. I actually didn’t even know what it was called, but after some googling I figured out the proper name…. which, it turns out, is not “thumbprint thing.” If you happen to be an avid baker, you might have one of these. But if not, you can just use the handle of a wooden spoon and press and shape the tots into little “cups” just the same. Just to be sure, I did it with a couple batches that way, because I’m here to make life less difficult. If you want a tamper thumbprint maker thing, here’s where you can get one: click here! 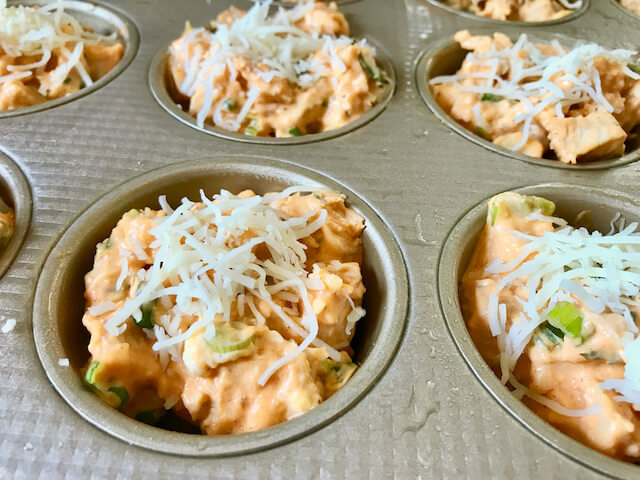 Fill up each cup with the Buffalo Chicken mixture, and top with the other half of the mozzarella cheese. Place back into the oven for about 15 minutes. All done! Let’m cool off for about 5 minutes before removing from the pan. …Aaaaaand, hello gorgeous! These are now offically my favorite food group. Make’m extra purdy by drizzling them with a little extra hot sauce, and adding a few chopped green onions on top. And I highly recommend that you make’m even more extra delicious by whippin’ up a batch of my Skinny Ranch to dunk’m in! Peace, love, and tater tots my friends! 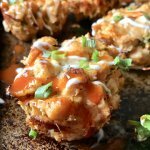 These Buffalo Chicken Tater Tot Cups are filled with spicy, cheesy, chicken perfect for meal prep and parties. 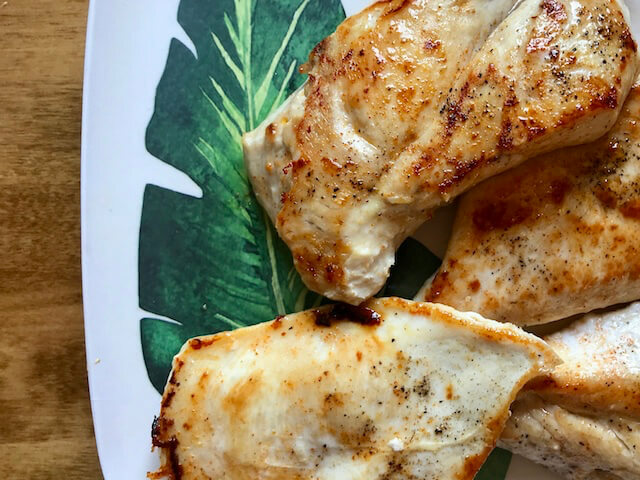 If opting to use uncooked chicken breast: Season each side of chicken breast with salt and pepper. 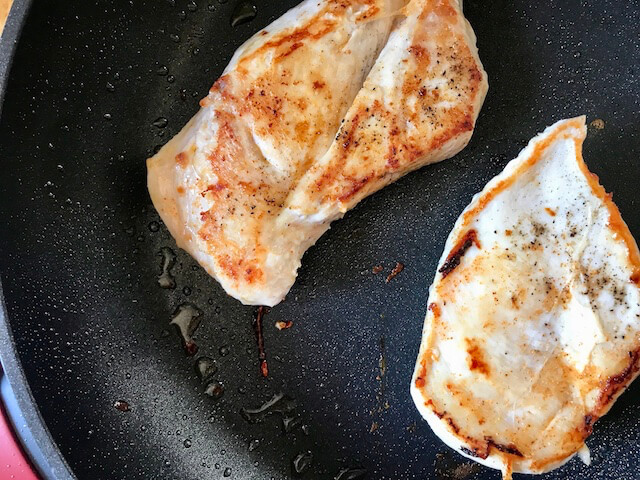 Heat a large skillet over medium heat, spray with cooking spray, place chicken on skillet and cook for 4 minutes on each side or until meat thermometer temp reaches 165 degrees. When the chicken is cooked through set aside and let rest for 5-10 minutes. If you have already cooked chicken. Disregard this step and use 3.5 cups cooked and chopped chicken. Spray a 12 cup muffin tin with cooking spray very well. Place four tots into each cup. Bake for 15 minutes. 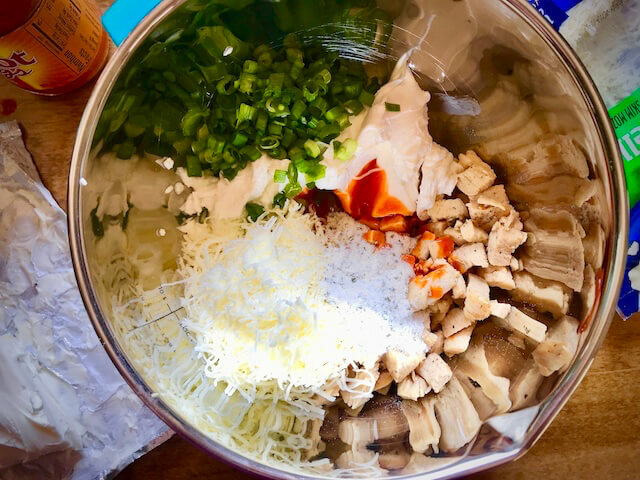 In a large bowl add chopped chicken, green onions, cream cheese, greek yogurt, ranch seasoning mix, buffalo wing sauce, and half of the mozzarella cheese. Stir together until combined well. 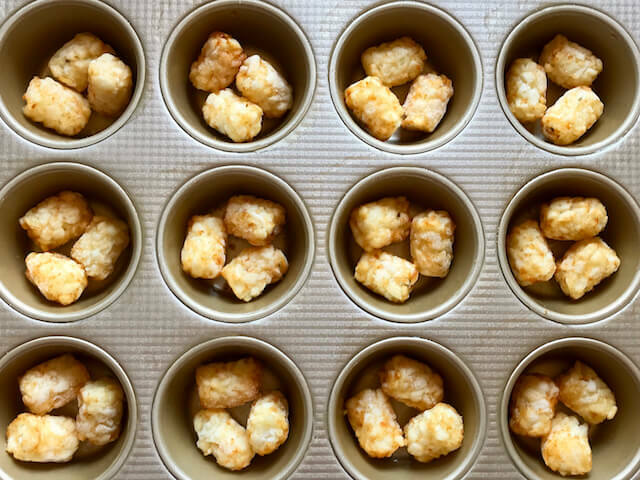 After 15 minutes remove tots from the oven and use a tamper or handle of a wooden spoon to gently press and form a tater tot cup. 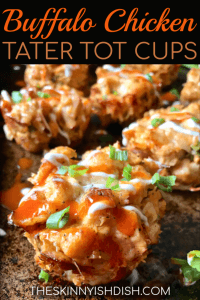 Fill the tot cups with Buffalo chicken mixuture and sprinkle the remaining mozzarella cheese on top of each tin. Place the tots back into the oven for 15 minutes. Remove from oven and let cool for 5 minutes before removing from the muffin tin. Drizzle with extra buffalo wing sauce and/or skinny ranch and top off with a few chopped green onions, if desired. Thank you SO much for this recipe! These are a game changer, seriously! All of your recipes have helped me so much with eating healthy and staying within my points. My family greatly appreciates your recipes with how yummy and easy they are! Hey Megan, I’m soooo happy you and your family are enjoying the recipes. Thanks so much for stopping by to let me know and to also rate the recipe! This looks so good!! Would I be able to omit the cream cheese somehow? I think that should be okay. You’ll want to add a little extra cheddar, greek yogurt, or sour cream to replace it. Hi, have you made these in advance and frozen them? I need way more than 6 servings for a party! They sound delicious! You need to do a cookbook! So happy you love them, Robin!! Thank you so much for letting me know! Made this Sunday night was AMAZING! My family loved them plus they made fantastic leftovers! My husband looked at me during dinner and said ‘I thought you were going to cook healthy tonight’… I said I did as long as you don’t eat too many! Keep the tater tot recipes coming!! Yay! So happy y’all enjoyed, Jenn! Made them for the second time yesterday… just had it reheated for lunch. Eyes roll back in your head good. Coworkers totally jealous. Thank you again for an AWESOME recipe : )! i was wondering if you could make this a main meal? like in a casserole dish? Yes! It totally works that way. Made these today! Simple and delicious!